In Washington Park, residential buildings built during the 20th Century have seen changes in use and ownership. The resilience of buildings can be measured by its ability to accommodate diverse cultural practices, lifestyles and functions. We discovered one such resilient building that was built for 20th century families. The building adapts perfectly to the lifestyles of new Hmong American homeowners. This residential duplex is set on a single lot facing east. The building has three stories with two separate living units on separate floors. The front porch spans the eastern facade of the entire building. 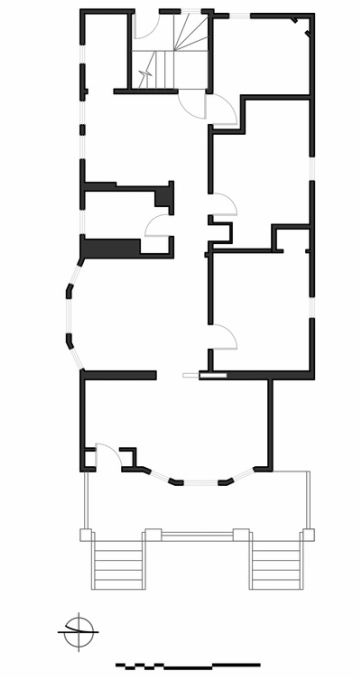 The ground floor apartment has two entrances located in the front (east) and rear (west) ends of the building. The entry sequence and interior layout create a distinct front, middle and back section inside this apartment accentuating a front/middle/back trichotomy. The middle living space mediates the formality of the front room and the lived-in informality of the back service areas. The contemporary use of this home inverts the front/back spatial domains during ceremonial events. The occupants of this structure use the rear door as the primary entry into their home. The kitchen becomes the most public space followed by the adjacent living room. In addition to changing the use of interior spaces the new residents transform this home via ephemeral sensorial modifications such as smells, curtains, plants, shrines, decorative objects and bric-a-brac. A large number of indoor plants bring the verdant ambience of the outdoor gardens into the home. Indoor shrines calling on the spirit of forefathers are carefully arranged. Little shrines hold incense and eggs in a bowl of rice. A red ribbon tied around doorknobs symbolize shamanistic rituals. The fragrant smell of incense permeates the entire home but is the strongest at the entryway near the main shrine. The aroma of Hmong food such as boiled chicken fills the kitchen. There is also a strong smell of soap in the bathroom. As we move around the home we encounter carefully framed pictures of family and friends in private bedrooms. We also find pictures of Packers players hung above the TV in the living area. In this multi-generational home, contemporary technologies and electronics used by the younger generation coexist with the symbolic artifacts that are meaningful to the elders. This home was very interesting in the fact that there are many traditional religious aspects to it. This Hmong household is Shaman so when you walk into the home there are shrines, incense, and red ribbons tied around the door nobs of every door. Back: The rear entrance leads into a kitchen with a walk-in pantry. One of three bedrooms is located immediately to the left upon entering the kitchen. Upon continuing eastward through the kitchen one discovers a small hallway that allows access to a middle bedroom immediately to the left. A bathroom and a door-less utility closet sit at the end of the hallway. Middle: After exiting the hallway one enters the living area with a south-facing bay window. A door leads into the easternmost bedroom attached to this living space. Front: The front room of the house is separated from the living room by a pocket door located along the northern dividing wall. This front room contains the only interior access to the exterior porch, as well as an east-facing bay window.